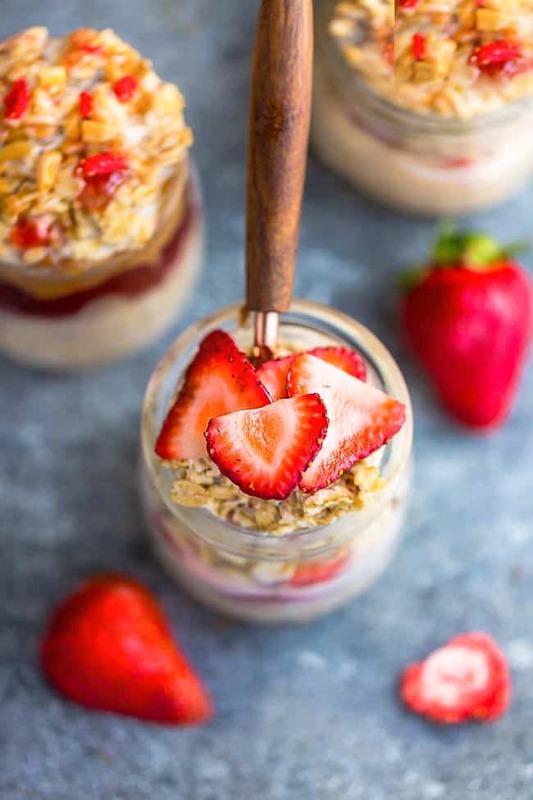 This easy Strawberry Overnight Oats recipe is a perfect make ahead breakfast. It only needs 5 minutes of prep time and is packed with healthy fiber and protein. Quick and easy breakfast recipes that you can make ahead are a favorite during the busy week. Baked oatmeal cups, egg muffins and overnight oats are all healthy options we like to keep have on hand. 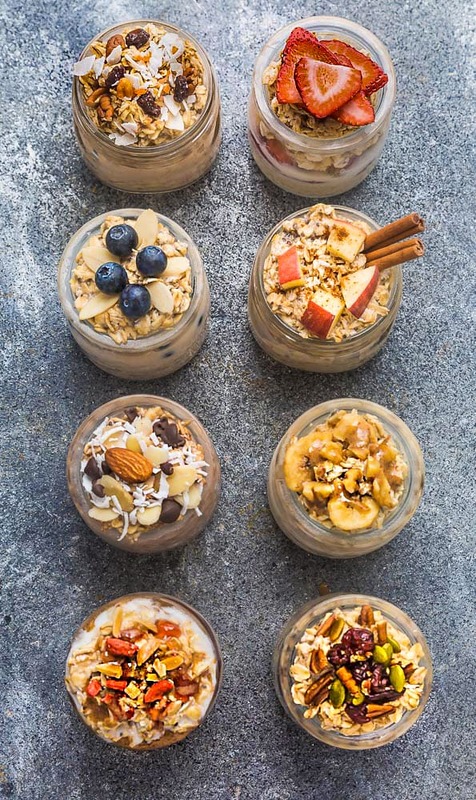 Overnight oats are not only nutritious, they are especially perfect during the spring and summer when you don’t feel like cooking over a hot stove. You can make a batch on meal prep Sunday and they’re simple to customize with your favorite flavors. And since strawberries are SO good right now, these Strawberry Overnight Oats are our latest favorite. Oats: Overnight oats are typically made with old-fashioned rolled oats and sometimes quick oats. Use gluten free as needed. 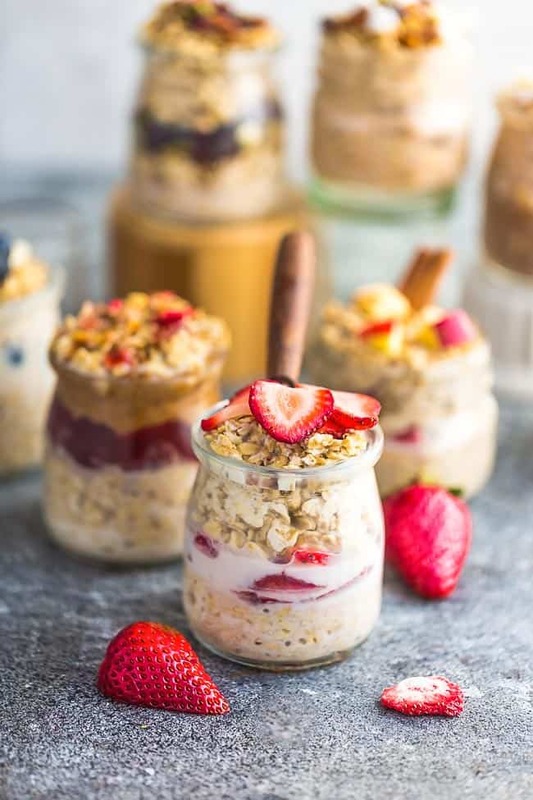 Chia Seeds: Chia seeds give overnight oats that thick pudding-like texture and add extra fiber but feel free to leave them out if you aren’t a fan. Milk: Use your favorite dairy or dairy-free milk you like or have on hand. We usually like to use almond but coconut milk, cashew milk all work great for a vegan option. Yogurt – You can add a combination of milk and yogurt to make your oats extra creamy . Fruit: Have fun with your toppings. Add fruit that won’t get mushy directly into the mason jar or toss them on directly on top of the oats when you’re ready to eat. Sweetener: Leave out or use any sweetener you like – honey, maple syrup, a ripe banana, dates or any low-carb liquid sweetener like stevia, monk fruit or erythritol will work. Nut or seed butter: Almond butter, cashew butter, pumpkin butter, sunflower seed butter and or peanut butter add that savory-nutty flavor and a certain creaminess. These strawberry overnight oats are one of the easiest breakfasts that even your kids can help you assemble the night before. You can use a mason jar, resealable container or a bowl. To begin, combine uncooked rolled / old-fashioned oats, milk / Greek yogurt and sweetener and spices if using. Scoop some of the oats into a bowl, mason jar or a resealable container. Slice or chop up some strawberries and layer over the oats. Spoon in the rest of the oats on top. Alternatively, you can just mix in the strawberries with the oats and just add everything into the jar or container all at once. Seal up the container and park it in the fridge overnight. 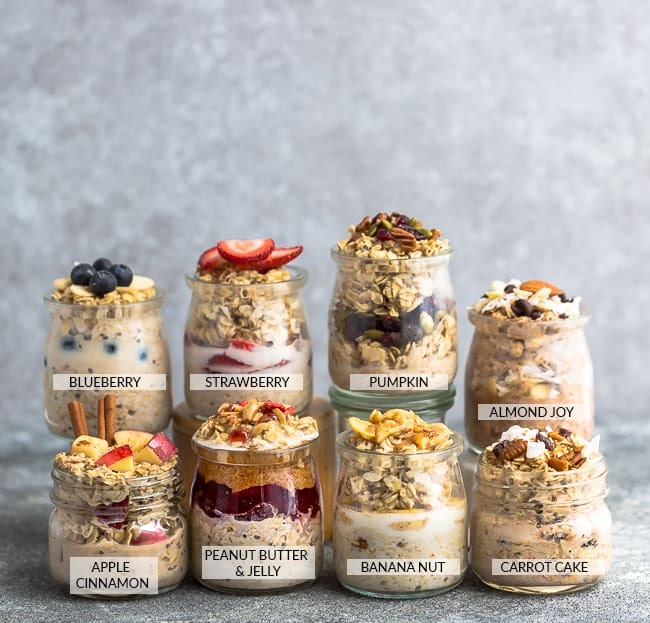 The next morning, you can heat the glass jar up in the microwave for a hot breakfast or enjoy your overnight oats cold straight from the fridge. You can add more milk and any fun toppings of your choice. Double or triple the batch and divide into separate mason jars or resealable containers. You can add some coconut, lemon, honey, maple syrup or add a few slices of bananas for extra sweetness and potassium. Serve with bananas, blueberries and blackberries for a triple berry treat. Or for even more Overnight Oatmeal options – be sure to check this post out with 8 fun flavors! 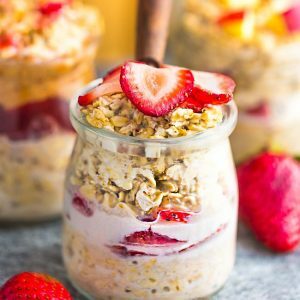 Strawberry Overnight Oats - the perfect easy make-ahead breakfast to enjoy for on the go. Best of all, just 5 minutes of prep time & packed with fiber and protein. Top with fresh strawberry slices before serving, if desired. Enjoy cold or heat up in the microwave. Double or triple the recipe and divide into separate mason jars or resealable containers for up to 4 day. Enjoy cold or heat up in the microwave and add toppings of choice. 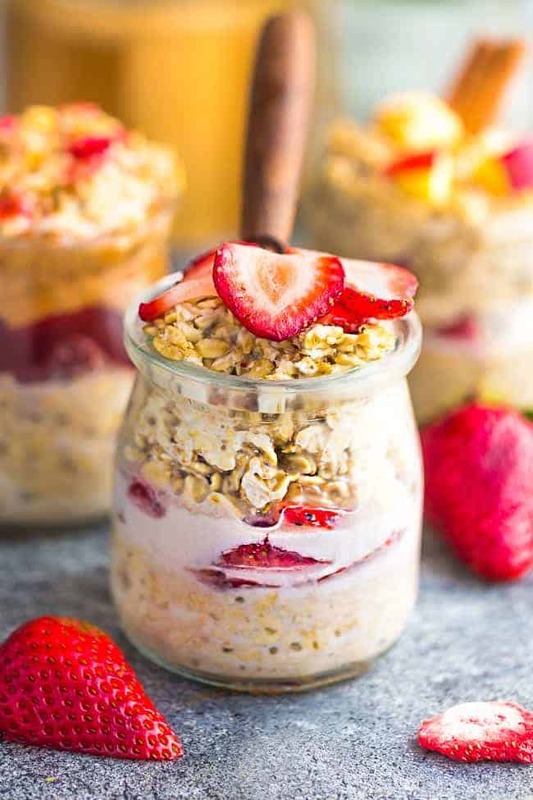 (Alternatively for a layered look, - add half of the oats to the bottom of the mason jar, then layer with strawberries and add the remaining oats). This is our new favorite breakfast! Thank you!